Hate the Fat Love the Fatty? I’ve been coming across this sentiment more and more often. It’s a play on the “hate the sin, love the sinner.” trope from Christianity. The idea being that people who don’t like part of who we are can simply, for their convenience, consider that part to be separate from us and insist that it’s fine that they hate it, because it’s not really who we are – because obviously other people know better than we do what our true sexual orientation, gender identification, body size etc. are. No, I don’t think so. As a queer woman I completely reject people’s insistence that my being queer is something that they can separate from me, and actively hate, while still claiming to love me. Screw that. 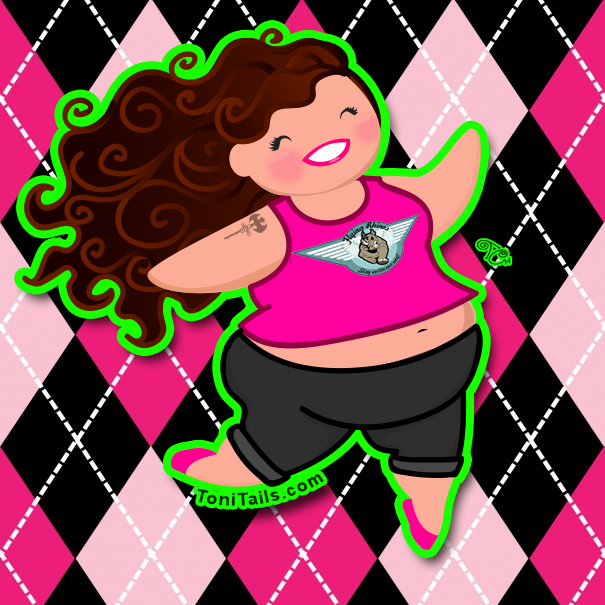 As a fat woman I reject the idea that someone can wage war against my fat but not against the rest of me. I am not a thin woman covered in fat, I am a fat woman. A war on obesity is a war on me – the weight-based stigma, bullying, and oppression that stem from it affect all of me – not just my fat. I’ve recently heard various people suggesting that those of us who have people close to us who subscribe to the “Hate the … Love the…” theory of personal relationships should try to “agree to disagree.” While I completely support people’s choice to make peace with those who do not accept who they are, I reject the idea that it’s the only option, or the best option for me. Some people choose to agree to disagree and that’s entirely their right, but some of us choose another option – we choose to walk away from people who choose not to be in total loving acceptance of us. We decide that we deserve better than to be loved as a fat person but hated for our fat (or whatever “sin” people feel we’re committing by existing, which cannot be conveniently separated from who we are.) We demand that those who want to continue to interact with us examine a society that teaches judgment and intolerance and find it wanting. We demand that, if they want to love that society, they do so while hating its sins of judgment, intolerance, stigma, bullying and oppression, while fully supporting and celebrating who we are. Nobody is under any obligation to love me, but nobody gets to be in my life if they claim to love me but in reality only love the person they wish I was. Ask Me Stuff! I get a lot of reader questions, so I thought it would be fun to start a new thing on Saturdays on the blog where I’ll answer those questions, kind of a “Dear Dances With Fat” you can ask for advice, or ask me a question about me – anything goes. I’ll do it on video (and of course publish a transcription as well. If you’d like to ask a question, please leave a comment here or e-mail it to me at ragen@danceswithfat.org. I love how you are able to articulate arguments that get muddied in my mind because of how overwhelmed with frustration I get, once they are put out there. This post is so important. I feel like I just want to second what you said…that’s it exactly. A lot of these subjects make me so emotional that it is always an intense, unexpected relief to read a perspective so validating to my own! I particularly appreciate her whole take on the entire “love the _ , hate the _” rampant craziness. I’m fat. I’m not temporarily not thin. I’m F-A-T fat. I cannot separate that from me any more than the various queer people I’ve known and loved can separate that queerness from who they are or people of color (and that’s such a beautiful rainbow!) can separate their color from who they are. I can agree to disagree with someone’s politics, if need be. I can agree to disagree about religion. These are things that may be profoundly believed and deeply loved, but they are things that can also change with new information or deep contemplation. They are not innate. So when someone uses religion or politics as an excuse to hate something innate about me, I cordially invite them to get bent. I rarely disagree with you Ragen, but I find myself doing so in this point. I guess it’s because I don’t see love in the Christian sense as actual warm, fuzzy emotions or approbation. It is (if you’re doing it right, IMO) merely the ability to put aside any personal feelings about the person and have sense enough not treat them poorly and otherwise minding one’s own business. So, I’m fine with people “loving” me but hating whatever in that sense, so long as they’re doing it right and staying out of my face, my way, and my life in general. Rarely do the people who say those things do it right. Usually it’s people being called out for being hateful that spout this nonsense. If Christians were all loving like Jesus said to, this wouldn’t be an issue. Agreed. It’s pretty well a problem with execution, not the concept itself. When I am charged more to fly in a plane than the person next to me because of my size, it isn’t my fat that bears the financial cost. It’s me. My budget, my spending plans, my ability to afford to visit my parents and thereby connect with my family and community. When doctors are targeted to offer WLS to all their fat patients, it isn’t my fat that gets spoken to condescendingly in the doctor’s office. It’s me. And if I were to relent and agree, it wouldn’t be my fat that bears the risk of severe long-term effects including death. It’s me. When someone I know parrots a gross fat joke in front of me, it isn’t my fat that goes on to wonder if they tell similar jokes about me when I’m not around. It’s me. When I was unemployed, it wasn’t my joblessness that ran the risk of getting sanctioned and facing homelessness and bankruptcy at the whim of ignorant, privileged and often abusive and prejudiced jobcentre staff. It was me. My “sins” (and as a fat, queer, non-binary, mentally ill poor person there are some who would say I have many!) aren’t blemishes on my otherwise perfect self. They are me. They are what makes me who I am. And it is the whole of me that experiences the effects of people’s judgement against them. When I say I love this comment, it’s not the fat that agrees with everything you said, it’s me. Sins are actions, not feelings or states of being. So, yes, I can hate the lying, the bullying, the hurtful behavior, and still love the person doing it. That, in my mind, is “Hate the sin, love the sinner.” Of course, loving the person and hanging out with the person are not necessarily the same thing. Sometimes, we have to pull back for our own protection, such as when an addiction is out of control. I can hate the lies, but still love the lying liar who tells the lies, while knowing that I have to protect myself against those lies, and if that means leaving, then that’s what it means. Or it may mean staying there, but never trusting the liar. Or maybe becoming such an expert at reading the liar’s micro-expressions, ticks, quirks, and tells, that I can be sure when the liar is lying or telling the truth. Being aware of a person’s flaws, and loving the person, anyway, is not condoning nor dismissing those flaws. It’s knowing that every person has flaws, and figuring out which flaws you can live with, and which ones you can’t. But hating someone for how they feel or look or think is ridiculous. It’s ACTIONS that make the difference. Actions are what make the difference between good and evil. You can claim to be angelic, but if you go around kicking puppies all day, then that makes you evil, in my book. And words ARE actions. The act of speaking or writing IS an action. And those people who judge you, Ragen, for being queer or fat or female, are sinning when they act on that. They can think what they like, so long as they keep it to themselves. Once they start spouting hatred, and letting the hatred affect their actions, then that’s sinning, and it NEEDS TO STOP. Same for size-hatred, race-hatred, and all the other hatreds out there. Like Thumper said: If you can’t say something nice, don’t say anything at all. That’s actually probably the best summing up of how “hate the _, love the _ ” SHOULD be that I’ve ever read…considering how rarely it’s used to address actual choice-based actions vs intrinsic parts of one’s being! Because people who are angry generally don’t have as high a level of reading comprehension as they do when they are calm. The phrase “Hate the sin; love the sinner,” is problematic. It CAN be applied well, but it can also be twisted to justify all sorts of bad behavior.